New villa with large windows located near the village and offering an extraordinary view of the surrounding mountains and the village of Claviers. The property comprises 5 bedrooms, 3 bathrooms, a 11m x 5m pool surrounded by large terraces with 10 sun loungers and parasol, a pool house, a covered terrace with barbecue and a petanque area. The kitchen is equipped with an oven, a microwave, a dishwasher and an American fridge. A washing machine is also available on the terrace. Free wifi, hifi, dvd player, air conditioning and TV are available in the living room. A second TV is available in one of the rooms. All rooms are equipped with an electric blind. The property is fully fenced and equipped with an electric gate. A vast private parking is available in the property.Source of total change of scenery and absolute calm, the villa offers modern comfort in a traditional setting in the south of France. 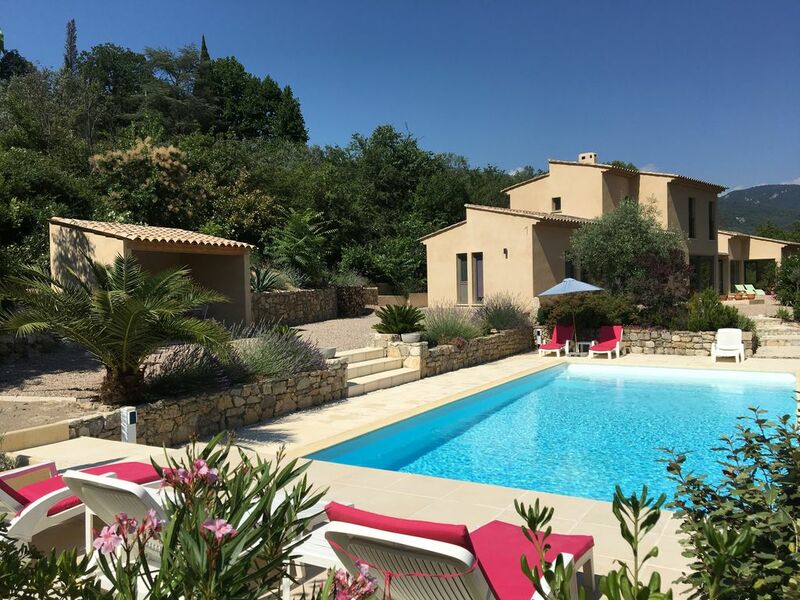 The property is located 20 km from Draguignan, 15 km from Fayence, 45 km from Grasse and 35 km from the Gulf of St Tropez (St Maxime, Fréjus, St Raphael). Bargemon is a starting point for various excursions such as the Verdon gorges (30km) with Lake St Croix, Lake St Cassien, perched villages (Seillans, Callian, Tourettes), the peninsula of St Tropez (St Tropez , Gassin and Ramatuelle) and its beaches. Not to mention the magnificent golf courses of St Andreol (La Motte) and White Earth (Tourrettes). possible stays of less than 7 days outside July and August. A high specification, modern, well equipped property with a pristine pool. The local contact was very helpful and we were made to feel very welcome. The garden has many trees and combined with the views, makes for a tranquil private setting. Bargemon is only a 20 minute steep walk away along safe pathways. Nous avons passé une semaine idyllique au sein d'une villa moderne. La piscine ainsi que la maison sont dans un état irréprochable. Les pièces de la maison sont spacieuses mais surtout très confortables ! Le parking est largement suffisant pour 2-3 voitures. De plus, la maison a une situation idéale car nous pouvons descendre sur les villes cotières ou de l'autre côté vers les gorges du verdon. Le propriétaire nous a toujours répondu agréablement et rapidement. Il n'y a rien à dire de plus hormis que c'est un petit havre de paix ! Het huis is schoon, geriefelijk, modern en van alle gemakken voorzien met een heerlijk zwembad. De omgeving is prachtig met een gezellig Frans dorpje Bargemon in buurt. We hebben genoten van het verblijf. Wij vinden het een aanrader . Eine tolle Villa ruhig gelegen in einer wunderschönen Landschaft. Da fehlt einem nichts! Eine gut durchdachte und gut ausgestattete Villa mit herrlicher Aussicht. Ein toller, gepflegter Pool ist perfekt für Spaß und Abkühlung. Man kann die Ruhe und quasi ungezwungen für sich alle Angebote des Grundstückes genießen oder von hier aus tolle alte Orte mit guter Gastronomie entdecken oder einen Ausflug Richtung Mittelmeer machen. Die Gastgeber sind sehr freundlich, hilfsbereit und jederzeit bemüht alles im Sinne des Gastes zu lösen. Wir haben uns sehr wohl gefühlt! Hilfreich ist sicher zu wissen, dass ein DZ mit einem Doppelstockbett eingerichtet ist. Wiederholungsfaktor 100%!